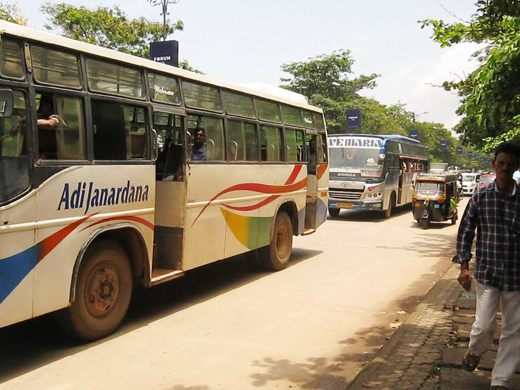 Mangaluru, Aug 29, 2016: In and around Mangaluru, Unlike many other cities in the state, a larger number of people travel by private buses. According to an estimate, more than 500 buses ply in the district everyday and it is a nightmare for senior citizens and the handicapped to travel in these buses. The introduction of seat reservation for handicapped and senior citizens in private buses, had made people glad that they would not have to beg for a seat any more. However, the rule has remained only on paper in many cases. Usually the seats reserved for senior citizens are occupied by youngsters, who are not caring enough to vacate the seats for handicapped and/or senior citizens. People are afraid to ask for the seats when really in need for fear of retaliation of different types. Even a request to those who occupy the seats invites only a care a damn attitude often. Bus conductors totally ignore this and just shrug it off without a care, though they are obliged to see that the rules are followed. Speaking to media an elderly social activist and regular bus user, seriously said that very few passengers leave the seats meant for senior citizens and handicapped. Loud music, rash driving and spitting in moving buses have become order of the day, he regretted that nobody supports senior citizens even when the latter raise their voices against injustice. "Such problems are more in Mangaluru city when compared with other cities as private buses play a major role here," he said and suggested that the mayor and corporators should form a committee to provide better facilities for seniors in society. There is an urgent need to put signs that spitting from bus is prohibited and seats where possible must be given to handicapped and elders. Creating awareness on by college students themselves with the support of authorities is very urgent. When contacted, RTO G S Hegde said that the RTA has already taken measures in this regard and the issues have been raised in bus owners’ meetings besides conducting training programmes for conductors. Perhaps an effective and accessible means to put on record/complain is needed now. i disagree of having senior citizen while on express bus from mangalore to karkala,if senior citizen wants to go to out of mangalore and when is in or around mangalore,he should first go to bus station state bank and take the express bus but in middle like if he is coming in from nanthoor stand or else should not complain. Be human .The reserved seats for the senior citizens are lees , butif see them standing we have to offer them seats. We cannot blame anyone for this.